Gain access to in-depth research and due diligence on managed accounts, mutual funds, and ETFs through out comprehensive research application. Envestnet gives you unparalleled access to investment options and the full range of tools you need to modernize your trading, reporting, and investment administration. Deliver your current portfolios or augment them with investment choices from thousands of leading separately managed accounts, ETFs, and liquid alternatives. Generate customized portfolio reports and investment proposals and streamline your operations with an open architecture platform that empowers you to upgrade your clients' experience. And, leverage PrimaGuide, our online portal to objective due diligence, asset allocation advice, and non-traditional investment strategies. Lastly, you can gain access to thousands of financial advisors on the platform by making your investment strategies available to them. To get a strong sense of where you are today—and where you can be with Envestnet—take the following brief diagnostic. Click on any of the following statements that may apply to your current situation. My firm is looking for a way to streamline the administration of our investment models with the ability to broadly distribute. Through Envestnet’s ManagerOne™ Platform—an outsourced wealth management portal for investment managers—you are able to build, manage, trade, report, service, and sell your firm’s proprietary portfolios. This platform not only streamlines the model management process but also allows you to distribute your investment offerings, access other institutional quality investment solutions as well as provide real-time insight into new business opportunities. I’m looking for a way to better communicate, service, and support advisors we work with. Envestnet delivers a robust advisor console that delivers innovative wealth management tools, access to a wide universe of investment vehicles, multi-custodial interfaces, billing, and administrative support. You can manage your models more effectively and provide advisors with a professional platform to manage their accounts and present investment proposals. I'm looking for comprehensive research and due diligence that can effectively supplement my investment expertise. Through Envestnet | PMC, access objective, in-depth research and due diligence on managed accounts, mutual funds, and ETFs as well as leverage actionable product recommendations and thoughtful asset allocation advice. I would like my firm’s products more broadly distributed and available to advisors on the Envestnet platform. You can complete a request for information form and submit it to Envestnet | PMC for evaluation. Email certifications@envestnet.com. Scale your business with access to front-, middle-, and back-office services that deliver portfolio management, product distribution, and real-time insight into advisors’ accounts. SCREENSHOTS ARE FOR DEMO PURPOSES ONLY AND DO NOT REPRESENT ACTUAL CLIENT INFORMATION OR ACTUAL INVESTMENTS. NOT ALL SCREENSHOTS MAY BE APPLICABLE TO YOUR FIRM. 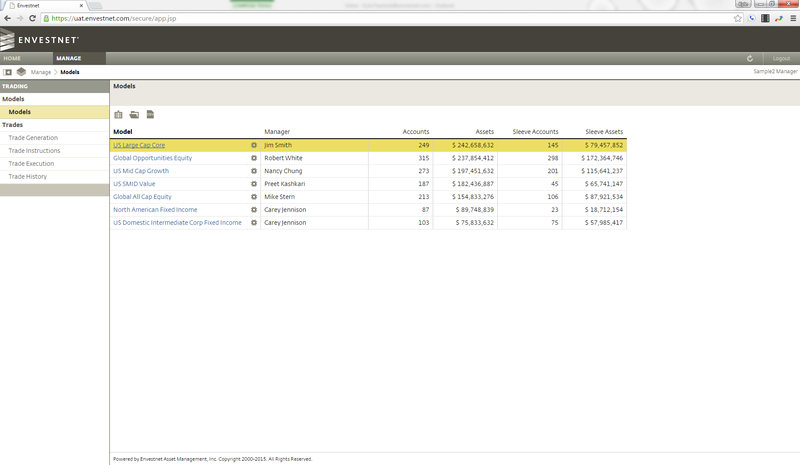 Access a manager console that allows you to build, manage, trade, service, and sell your own proprietary models. Dashboard views give you real-time details of the investment proposals that use your firm’s proprietary solutions.